Music’s healing powers are well-documented, but at New York’s Mount Sinai Hospital, two musicians—who both suffered from the same medical condition—combined their talents to put those powers into action. Last April, they launched Concerts for Patients, a free chamber-music series held in the hospital’s atrium. Kristin Olson, an oboist, and Nadir Aslam, a violinist, met when they were being treated at Mount Sinai for spontaneous pneumothorax, also known as collapsed lung. Now fully recovered, thanks to Dr. Andrea Wolf and Dr. Andrew Kaufman, they are back to making music, much of it for the patients (and staff) of Mount Sinai. 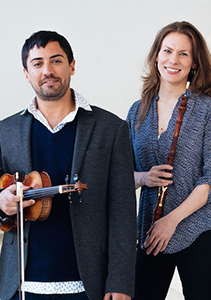 Aslam, who has a particular interest in outreach and teaching, also plays with Olson in Grand Harmonie, a period-instrument orchestra that presents concerts in New York and Boston, and La Fiocco, a period-instrument ensemble based outside of Philadelphia. Olson plays as well with Sacro Profano, a baroque ensemble in the Seattle area focusing on 17th- and 18th-century music. She also makes and sells oboe reeds. Aslam and Olson are acutely aware that many people are hospitalized alone, without friends or family to visit. “We’ve turned our potentially career-ending illnesses into a thriving musical experience for patients like they’ve never had before,” says Olson.